Established in 2009, Skipper Otto's is a community-supported fishery (CSF) based in Vancouver, BC. The CSF expanded to a total of 1100 members and 15 fishers in the 2014 fishing season. Skipper Otto’s is encouraging food sovereignty and sustainability by providing fishers with fair prices for their catch, creating a direct connection between local fishermen and consumers, and providing educational resources to the community. We are an interdisciplinary and multicultural team of student researchers from the Faculty of Land and Food Systems at the University of British Columbia and have collaborated with Skipper Otto’s to provide them with information to facilitate development of strategies to improve member recruitment and retention. The purpose of our research project was to learn about the barriers that prevent potential members from joining the CSF and to understand areas of confusion that members experienced when they first joined the CSF. Specifically, we investigated the following research question: Among potential and current CSF members, what are the factors that pose barriers to their participation in the CSF? Using our findings, we were able to suggest improvements to an existing informational video script for Skipper Otto’s website. We conducted in-person surveys of current CSF members at Thursday night pick-ups. With potential members, we conducted online surveys sent through UBC Farm’s social media and newsletter (n=2200) and the Living Oceans Society mailing list (n=35). Online surveys were also conducted in-person using iPads at Whole Foods and Save-on Foods (n=39). We surveyed 29 current CSF members and 49 potential CSF members. 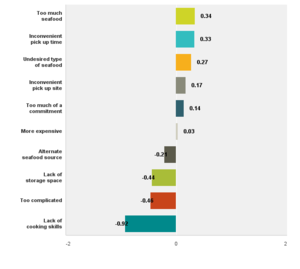 Our findings indicate that the main barriers for potential CSF members are concerns about receiving too much fish/seafood, having to pick up fish/seafood at particular times, and receiving types of fish/seafood they do not want. The results are limited by the short time frame, the small number of survey responses, and recollection bias. The results highlight the need to create greater awareness of the CSF within the community and to target those who attend farmers' markets and participate in community-supported agriculture. We suggest that Skipper Otto’s can increase member recruitment by expanding marketing efforts to counteract misconceptions about the CSF that we have highlighted in our report and by providing incentives to current members to recommend the CSF to friends and family. Our research project is a collaborative venture between our LFS 350 team and our community partner, Skipper Otto’s Community Supported Fishery (CSF). Established in 2009 as the first CSF in Canada, Skipper Otto’s aims to ensure that independent local fishermen can continue fishing and employ sustainable harvesting practices. The CSF emerged from the Community Supported Agriculture (CSA) model, which developed in the United States in the 1980s to allow the risk of farming to be shared between CSA members and local producers (McClenachan et al., 2014). As the seafood analog to the CSA, Skipper Otto’s is rapidly expanding, with a total of 1100 members and 15 fishers in 2014 (O. Dan, personal communication, September 26, 2014; Skipper Otto's, 2014). Although the CSF is headquartered in Vancouver, its distribution and impact extend throughout the Fraser Valley and British Columbia and into Alberta and Saskatchewan (see Scheme 1, or the following URL: http://prezi.com/80goc3dyah0e/?utm_campaign=share&utm_medium=copy&rc=ex0share). Our team worked specifically with the Skipper Otto’s team and their members in Vancouver. Scheme 1. 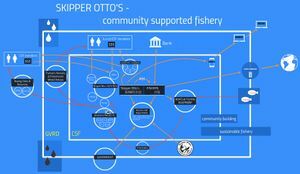 Food system diagram of Skipper Otto’s Community Supported Fishery and surrounding food shed. Skipper Otto’s distinctive business model promotes food security through a food sovereignty regime because it supports local, independent fishers, and CSF members can protect this local market from subsidized food imports by purchasing fish through Skipper Otto’s (Wittman, 2011). Within the conventional food system, ocean resources can be depleted and independent fishermen pushed out of business. As an alternative, Skipper Otto’s plays an important role by paying fishermen fair prices for their catch, which in turn allows them to use sustainable fishing methods, resulting in less bycatch and reduced exploitation of at-risk species. McClenachan et al. (2014) found that CSFs are utilizing locally abundant fish species that otherwise are not typically marketed. Our research team brings a diversity of disciplinary backgrounds to the project, including agroecology, food, nutrition and health, food science, dietetics, and global resource systems. Our project purpose is to report on the factors that are currently preventing potential members from joining the CSF as well as areas of confusion that current members experienced when they first joined the CSF. In addition, we will suggest improvements to an existing script for an informational video. By identifying barriers to participation in the CSF, our team can help Skipper Otto's gain more members, which in turn will support the achievement of their goals: employing more independent fishermen, protecting our ocean resources, and promoting food sovereignty within the local food system and Western Canada. To accomplish our project goals, we investigated the following research question: Among potential and current CSF members, what are the factors that pose barriers to their participation in the CSF? The research project for Skipper Otto’s was a collaborative effort between our group members and Skipper Otto’s staff. The main objective was to determine the barriers that prevent potential members from joining the CSF by conducting an online survey of potential members and an in-person survey of current members. 1) An in-person survey of current CSF members to ascertain areas of confusion for them as well as barriers that might be preventing their friends from joining the CSF (see Appendix A). 2) An online survey of potential CSF members to determine the barriers that prevent them from joining a CSF (see Appendix A). The in-person survey of current CSF members was conducted at the Skipper Otto’s pick-up location. Potential members received the online survey through UBC Farm’s social media channels (Facebook and Twitter) and Living Ocean Society’s e-mail list. Potential members also completed the online survey in-person on iPads at a Whole Foods or Save-On-Foods location. The background information for our research project included insights from the Skipper Otto’s team, information from their website, and information from research articles about CSFs in BC. Due to the dynamic nature of the project, our research methods evolved over the term. Our original approach was to create an informational video for new and potential members to explain how the CSF works, which transitioned into conducting surveys to determine the barriers that prevent potential CSF members from joining. Through careful development of both online and in-person surveys, we ensured that potential members received necessary background information about CSFs and CSAs and ensured that current members provided insight into the perspectives of their non-member friends. The online responses were collected and analyzed using SurveyMonkey, while the in-person survey responses were compiled and analyzed manually. For the online survey, summary data from closed-ended questions were displayed as tables or charts. Responses to open-ended questions in the in-person survey and online survey were aggregated and categorized to provide an overall summary of the types and frequencies of barriers. To reduce the bias of in-person surveying, we recorded the in-person survey responses on paper and analyzed them as a group to ensure that the information was not influenced by our own perspectives. Communication with Skipper Otto’s was established through e-mail, by providing links to our project charter and proposal, and by sharing a draft of our systems model. Also, the research group encouraged regular communication, participation, and collaboration amongst members, thus ensuring that responsibilities and tasks were fairly assigned. The online and in-person surveys and did not collect information that would identify the respondents. Together, the research group gathered quantitative and qualitative information to achieve the research objective. We surveyed 29 current CSF members. Among these members, 17.24% identified confusion with the process of purchasing shares prior to becoming a member. Specifically, these members had been confused about how to submit a payment to Skipper Otto’s, how to estimate how large a share to purchase (i.e., dollar amount), how to split a share with another member, and what happens to the unused portion of a share, or they had been concerned about not getting the products they paid for. However, 75.86% did not recall any confusion about the CSF prior to becoming a member. Similarly, 72.14% were not currently confused about any aspects of the CSF. However, 20.69% indicated difficulties with the current website in terms of the purchasing process and because of the constantly changing and confusing interface. The most common reasons why members thought their friends had not joined the CSF were: they did not eat enough fish to justify purchasing a share (17.24%) or they “hadn’t gotten around to it” and/or did not have enough information about the CSF (20.69%). 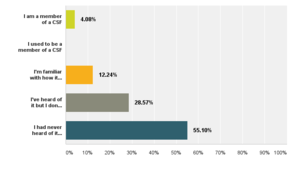 Support for sustainable practices was identified by 51.72% of respondents as a reason for joining the CSF. The product freshness, quality, selection, and price was a factor indicated by 34.48%. Convenience (members’ ability to pick-up fish at farmer’s markets or close to their home and the ease of online ordering) was a factor for 10.34%. Another factor for 37.93% of respondents was talking to Skipper Otto’s at farmers' markets or hearing about the CSF from a friend. We surveyed 49 potential members. 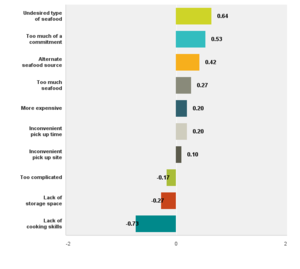 The most common barriers identified among all respondents were concerns about receiving too much fish/seafood, the inconvenience of having to pick-up fish/seafood at particular times, and concern about receiving types of fish/seafood that they do not want (Figure 1). The same top barriers were identified by those who were interested in joining a CSF but had not yet joined (Figure 2), whereas individuals who were not interested in joining a CSF were concerned they would receive types of fish/seafood they do not want or that joining a CSF would be too much of a commitment, or they had alternative ways to obtain seafood (Figure 3). Among all respondents, 55.10% were unaware of CSFs and 28.57% had heard of a CSF but did not know much about it (Figure 4). People familiar with CSAs or those who shopped at farmers' markets were more likely to be interested or very interested in joining a CSF than people who were not familiar with CSAs (50.00% versus 17.39%) and people who did not shop at farmers; markets (39.47% versus 11.11%). 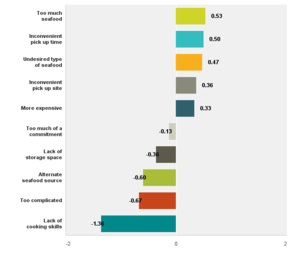 Figure 1- Most common barriers to joining a CSF among all respondents. Figure 2- Most common barriers to joining a CSF among people who are interested in joining a CSF. Figure 3- Most common barriers to joining a CSF among people who are not interested in joining a CSF. Figure 4- Familiarity with CSFs among all respondents. Our research project exemplifies stage 1 of the community food security continuum, in which community members create small but significant changes to the existing food system (McCullum, Desjardins, Kraak, Ladipo, & Costello, 2005). Data collected in stage 1 can be used to support stage 2, in which food system change is progressing and efforts are aimed at facilitating and stabilizing that change (McCullum et al., 2005); the activities of Skipper Otto’s CSF fall within stage 2. Through analyzing, interpreting, and connecting our findings, we identified misconceptions and actual barriers to participation in the CSF. Skipper Otto’s can utilize this information to further increase civic participation in the local food system (McCullum et al., 2005). Our findings reveal that most potential members are unaware of Skipper Otto’s, and more than a third of members heard about Skipper Otto’s through word of mouth. This suggests that current marketing efforts are only reaching a limited number of people. Some people also indicated misconceptions about Skipper Otto’s, such as concerns about receiving types of fish they do not want, which again indicates the lack of awareness of Skipper Otto’s and how the CSF works. Interestingly, some factors that we or Skipper Otto’s thought might be barriers to joining (no freezer space, too expensive) turned out to not be significant barriers after all. However, the survey data showed that there was some confusion with the online ordering process, which Skipper Otto’s was already aware of. This shows the importance of conducting the survey. Through our surveys, we were able to answer our research question because we identified the barriers that were most significant for both current and potential CSF members. These research findings will help Skipper Otto’s focus their marketing efforts to help eliminate misconceptions and communicate important information to current and potential members. However, our study is limited by the small sample size for both current and potential CSF members. Larger samples would help ensure that respondents are representative of the entire population. Our study is also limited by the short time frame of the project, which restricted the project scope and the amount of data obtained. The in-person responses are subject to several potential sources of bias such as interviewer bias, selective memory of the respondents, and/or bias introduced during analysis of qualitative data. We found that people who were familiar with CSAs or who shopped at farmers’ markets were more likely to be interested in joining a CSF. This suggests that it would be effective for Skipper Otto’s to maintain and even increase their presence at farmers’ markets or focus marketing efforts on people who are members of a CSA. It also suggests that people who are already participating in local food initiatives are willing to increase their level of participation, thereby increasing their support for sustainable local food systems and food security. Discussion with our community partner revealed that many local fishers are interested in joining Skipper Otto’s CSF. To support these fishers, Skipper Otto’s needs to attract more customers to match the increased supply of seafood. Through our community-based project, we found that word of mouth has been a relatively effective method for attracting members to the CSF. Therefore, Skipper Otto’s might consider a promotion to encourage current members to recruit their friends; a discount could be offered to both current members and the new members they referred. Our data also showed that many potential members identified barriers to participation in the CSF that were in fact misconceptions. Therefore, we believe that Skipper Otto’s needs to expand their marketing efforts to better inform potential members about how the CSF works and eliminate these misconceptions. To maximize the campaign’s effectiveness, we suggest focusing on the key factors identified through our research, as this would apply to the largest number of potential members. The expansion of Skipper Otto’s would result in a greater portion of the community’s seafood coming from a sustainable source and an increase in long-term food security for the community, as fishers will be able to continue fishing without depleting their sources of seafood. Additionally, we believe that increased demand for locally sourced seafood will have a domino effect whereby more fishers will see the benefits of the CSF business model and will therefore adopt it. We hope that over time we will see seafood production shift from the unsustainable industry it is today to one that considers food security to be essential for its success and survival. 1. Can you recall if there was anything you found confusing about the CSF prior to becoming a member? 2. Are there any aspects of the CSF that you find confusing now? 3. Can you think of any resources or factors that helped you decide to join the CSF? 4. If you have any friends that are interested in joining the CSF, do you know of any reasons that might be stopping them from joining? We are undergraduate students from the Faculty of Land and Food Systems at UBC, and we are conducting a research project on the potential barriers to joining a Community-Supported Fishery (CSF). The information collected in this survey will be used to develop resources that will help provide potential CSF members with a better understanding of how the CSF model works. Our goals are to spread awareness of the options available to consumers and help increase sustainability of the local food system. The survey should take about 5 minutes to complete. All responses are confidential. Teams of students from the Faculty of Land and Food Systems are conducting research as part of the UBC-based Community Food System Project within their course on “Land, Food and Community II” (LFS 350). The project engages over 25 community partners across BC to assess, promote, and enhance community food security in British Columbia. The study is a collaborative effort involving the Faculty of Land and Food Systems, Centre for Community Engaged Learning, and the LFS 350 Project community partners. If you have any questions please feel free to contact the Course Instructors and Principal Investigators, Dr. Eduardo Jovel and Dr. Will Valley. The following is a brief description of Community-Supported Agriculture and Community-Supported Fisheries. In Community-Supported Agriculture (CSA), members of the CSA pay the farmer at the beginning of the growing season and receive produce each week for the duration of the growing season. In a Community-Supported Fishery (CSF), members of the CSF pay the fisher at the beginning of the fishing season and receive fresh or frozen fish/seafood during the season. The fish/seafood is offered at member prices, and the cost of the fish/seafood received at each pickup is deducted from the payment provided at the beginning of the season. Both CSA and CSF aim to support local, independent food producers. In the case of a CSF, members' payments provide fishers with adequate funding for the season, allowing them to use less intensive and more sustainable fishing practices, such as targeting more abundant fish species and limiting bycatch. 2. How familiar are you with Community-Supported Agriculture? 3. How familiar are you with Community-Supported Fisheries? 4. Please indicate how interested you are in joining a Community-Supported Fishery, on a scale of 1 to 5 (where 1 is not at all interested and 5 is very interested). We are interested in identifying possible barriers to participation in a Community-Supported Fishery. For the following questions, please consider the reason(s) why you are not currently a member of a CSF, or why you do not wish to join a CSF. 5. Please indicate if any of the following statements apply to you. 6. Please indicate how much you agree with the following statements, on a scale of 1 to 5, where 1 is strongly disagree and 5 is strongly agree. 7. If there are any other reasons why you are not currently a member of a CSF, or do not wish to join a CSF, please provide more information in the comment box below. 8. Are there any aspects of a Community-Supported Fishery that you find confusing or do not understand? 9. Is there anything that might increase your interest in joining a Community-Supported Fishery? This page was last edited on 30 November 2015, at 19:55.